Before the web, in those dark days when today's newspaper (review) was tomorrow's chip wrapper, there used to be a saying: "All publicity is good publicity". And here's another: "Always welcome customer criticism". More often than you might expect, we meet business people who continue to hold these views. We hear comments like "A business that has nothing but positive reviews must be doing something dodgy" or "the odd negative comment never hurt anyone". When we do, we make a little bet with ourselves. It goes something like this: "We lay £5 at ten-to-one that they don't (yet) have any negative reviews." We win every time. We also carry a selection of real negative reviews when we visit potential clients. This is because the kind of negative they are seeing in their mind's eye is not the kind they are going to get in real life. They imagine a 'helpful' negative - something that says their business is great "but could be even better, if only..."
In the real world almost every negative, without exception, has the potential to put someone (more correctly: lots of 'someones') off using your business. We don't usually name names in this blog but we're going to make an exception here, because this point is so important. 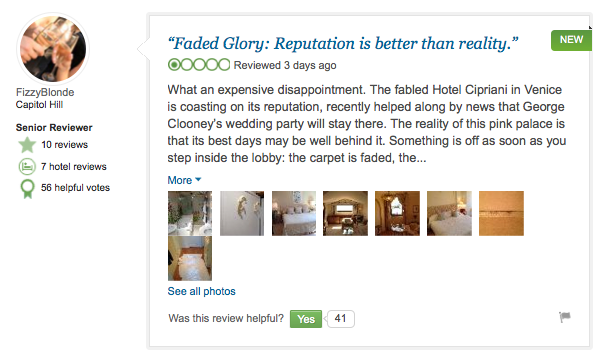 Read all of this recent one star review by FizzyBlonde of the Cipriani in Venice (the hotel George Clooney recently stayed in for his wedding). Did you notice that first time around? We have estimated in the past that only one reader in 20 votes for a TripAdvisor review. So how many potential guests were deflected by this single review? How many in the next month? Next year? One of our clients has conducted an in-depth study of the effect of a single negative showing on the front page of their TripAdvisor listing and they have positively identified significant lost revenue as a direct result. Negative reviews, all negative reviews, shown publicly, are unhelpful in the strict business sense*. For even the smallest hotel (and the best) that's going to be an impossibility, simply because of the volume of customers you have, but it should not put you off making your best efforts to manage them before they reach TripAdvisor or Google. Even if you don't have issues with occupancy, you know the negatives are affecting your ranking and that has a knock on effect on rates. For all other businesses it will depend on the nature of your relationship with your customer; our estate agent and business-to-business clients, for instance (where the relationship is so much closer) should aim for a clean sheet: no negative reviews on Google at all. Adopt Dialogue: get great reviews to your own website and other sites that matter (Google, TripAdvisor etc.) but deal with negatives in private. * Don't confuse reviews with feedback; all feedback is, of course, helpful. Dialogue will get you that, in private. An average of 8% of all reviews we process for clients contain some form of negative comment, but those views are being being voiced in private, between the business and their customer, not on Google, Yelp or TripAdvisor.